Way back in the early 1970s Ohira Shuzo fought his way to the final of the Nihon Kiin championship. This might not seem like a big deal, but only four players in history ever won that title: Sakata Eio, Takagawa Kaku, Ishida Yoshio and… Ohira Shuzo. Keep in mind that all of those other players had won both the Meijin and Honinbo titles as well. So this was rarified company indeed. 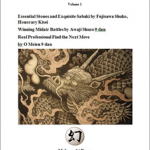 This gives some indication of Ohira’s reputation as a fierce fighter, but in those days, it was said that, "the strongest fighters are: First, Ohira Shuzo; Second, Kato Masao; Third and Fourth Places are empty; Fifth is…" Of course, Kato was renowned for his talent at killing opponents’ stones, so the fact that Ohira was considered the superior fighter is significant. As for Ohira’s opponent in this game, Miyashita Shuyo had the nickname of the "Wild Bull of Fukushima." I remember when he visited Los Angeles in the early 1970s and took on all comers at the Rafu Kiin (Los Angeles Go Association). It was like facing a hurricane. The club later took Miyashita out to dinner and then to rounds of drinking. Then it was back to the club. By that time it was late at night, and everyone was tipsy, no more so than Miyashita. But he took on all challengers, including sober players who wandered in. But they were no match for the master. One of the observers of those games said afterwards, "Miyashita somehow conjures up eyes for groups in miniscule spaces where you could not imagine stones could live. And then, when you think that your own stones are safe, they end up having a single oversized eye…"
Ohira san had been confined to home with a severe cold, and had not even managed to make an appearance at the traditional dinner held the night before this game, so I had not met him for a while. On the morning of Game 1 in the match, I greeted him for the first time in some time at the playing site, and Ohira san’s face looked hale and hearty. It seems that after eliminating a number of opponents on the way to earning the right to challenge for the title, it was natural that he should be hale and hearty, but that was not the only reason. When he ceded the championship title [the previous year] to Ishida, the present Honinbo, I felt that Ohira san was not enjoying good health. Ohira san told me that for whatever reason he had contracted the flu and could not shake it off. I heard the same story that Ohira san told of being troubled by the flu from another friend of mine. I thought myself fortunate to have avoided that illness. Besides that, Ohira san also suffered from an ear condition. When it comes to pain in the ear, I have experience with that, too. In my case, occasionally I suffered a sharp pain and ringing in the ear. It was unimaginably unpleasant, and with terrible discomfort I felt like the clear, blue skies were gone forever. That image of the figure of Ohira san in bad condition was burned in my mind. 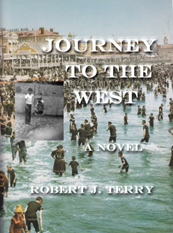 I was apprehensive that this time, to some extent, he was hobbled by an unfortunate handicap. On the morning of Game 1, my apprehensions and fears about Ohira san were blown away. Ohira san was back to his usual hale and hearty good health. Since he was in such a fit state, it was obvious that he would have no problem in taking up the challenge of the title. So much is without question, but I was gratified to be able to confirm that without a doubt. Played on December 8~9, 1971 at the Nihon Ki-in, Ichigaya, Tokyo. 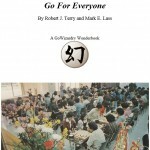 Through White 6 the course of play follows the old fashioned "Shusaku Style," but in accordance with Miyashita 9 dan’s masterful play throughout the board, we witness the game steadily getting out of control. 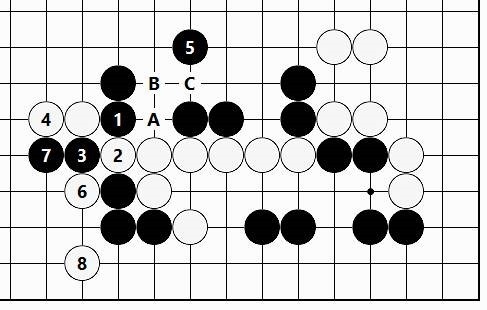 …should Black connect underneath at 1 here, I planned to adopt the model that develops with the extending move at White 6. The idea is to end up with the fencing-in move of White 20. 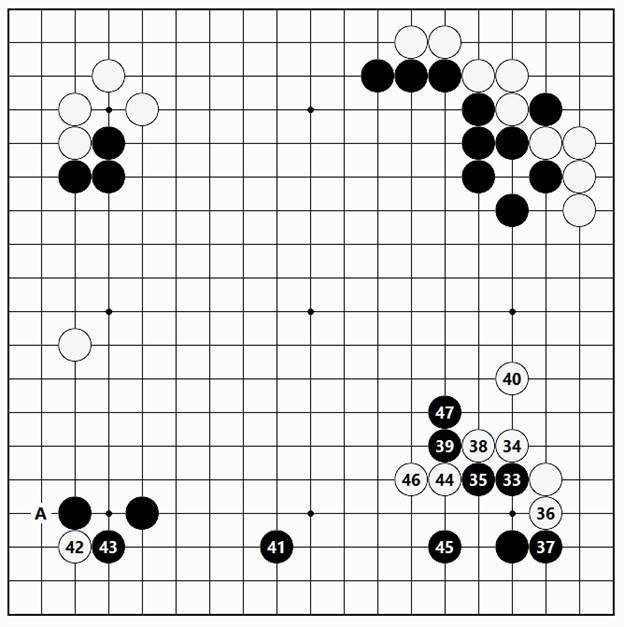 This exchange leaves the marked White stone working effectively, so it is promising for White. 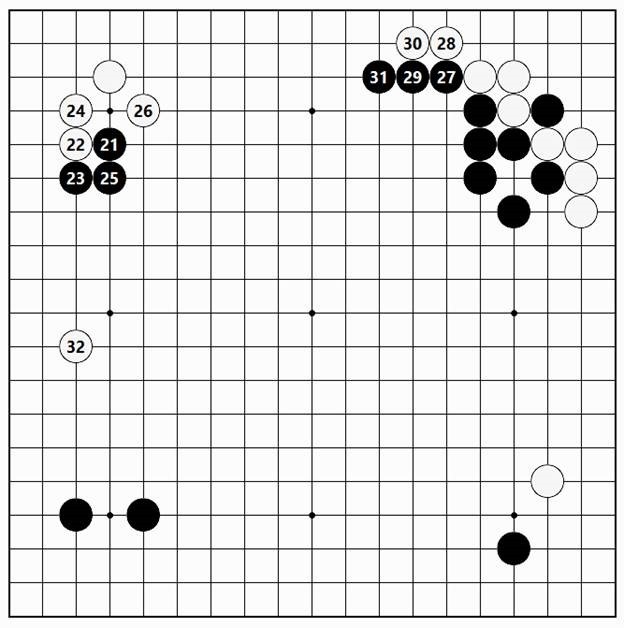 Black’s connecting above with 13 in the figure is done to avoid falling into White’s plans. …White 1 and 3 are joseki, but after the pincer of Black 4, White’s position over the whole board is thin and weak. The high attack on the corner with Black 21 is played to follow through completely with a thick and strong playing strategy. If Black uses the move of 21 to immediately hane at 27, after the joseki moves through Black 31, in this board position White would make the corner enclosure at 22. This is clear to see, so Black played the move of 21 to apply pressure to White first. 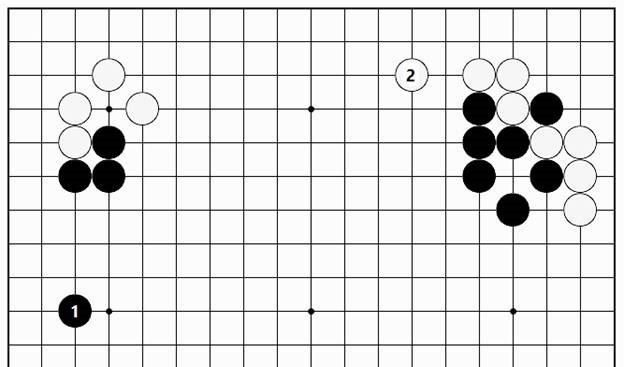 …if Black makes the [joseki] extension to 1, the jump of White 2 upsets Black’s expectation completely to Black’s disappointment. However, I was surprised that Black turned to play the hane at 27. 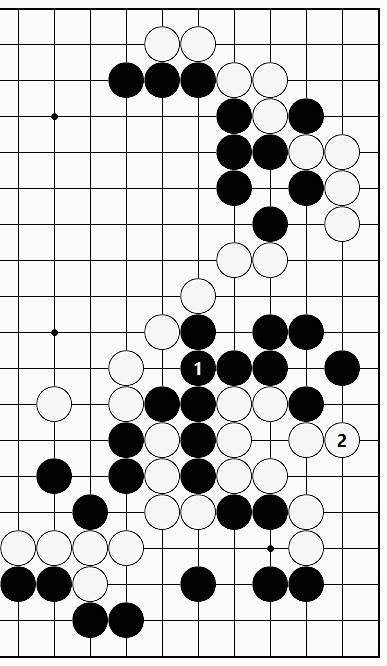 …the pincer of White 1 or A, but that would incur the checking extension of Black 2, and there would be no immediate attack that White could launch. For that reason, I chose to slip into the side [wari-uchi] with White 32. …the diagonal move of Black 1, but White would respond by slipping into the side with 2, and the position would turn into a leisurely paced one [which is advantageous for White]. …more than anything, White would like to slip into the lower side with 1, but then White would incur the blow of Black 2, which would be terrible. It is obvious that White would have to move out in bad shape with 3 and 5. 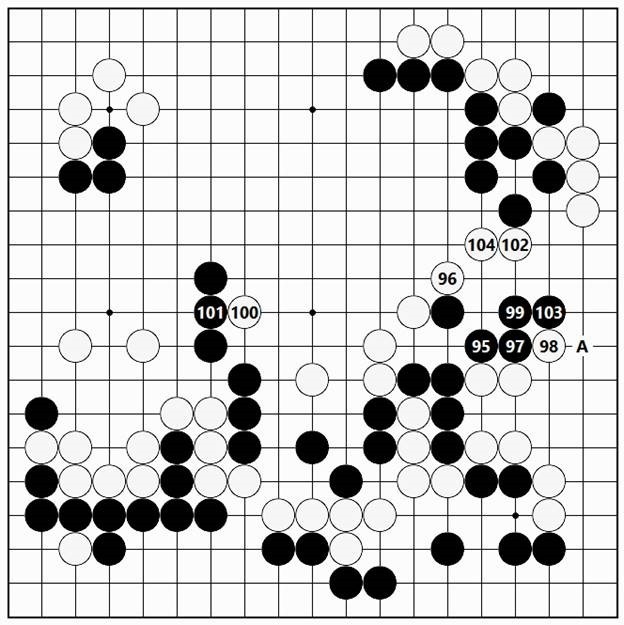 After Black connects at 6, the attack on the right side and the checking extension of Black A may be envisioned, and this excruciating situation is out of the question. The attachment of White 42 is played in anticipation of the cut of White 44 and the fighting to follow. I believed that this order of moves was correct at this point. Had the fighting on the right side proceeded and later the attachment of White 42 made, the response of Black 43 could not be expected. There is the fear that Black would put up resistance by descending at A. …should White make the diagonal move of 1, Black replies with the diagonal attachment of 2, and this is even more painful. If White defends with 3, Black leaves the hane at A for later and attacks with Black 4 and 6. Instead of White 3, extending out with White A would likewise be met by Black giving chase with 4 and 6. White remains saddled with the defect of B, where Black can cut. 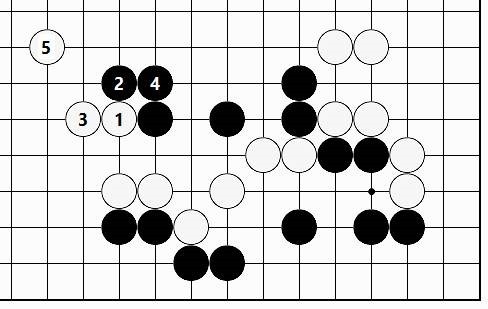 …should White hane at 1, Black would not cut at A, but play at 2 and 4, making the backbone of Black’s position thick and strong. This would benefit Black as preparation for a fight on the lower side. For that reason, I borrowed the moves of White 52 and 54 from Fujisawa Hosai’s playbook. 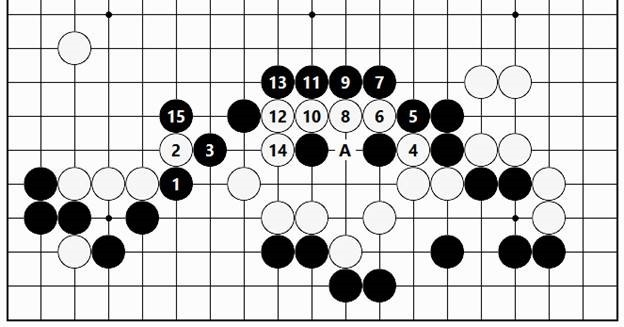 However, the surrounding conditions were different from those where he used this technique, so it did not work as well as it did when the Master played this way. Instead of Black 55, other options to consider were the connection of Black A and pressing at B, but I think that in this game in connection with the fight on the lower side pressing up at B would be the most powerful way to play. Regarding the jump of Black 57, Miyashita 9 dan expressed the following opinion. …pushing through with Black 1 and cutting with Black 3 is unreasonable. Assuming that White 4 is a forcing move (to defend against White pushing through and cutting with White A, Black B and White C), Back 5 cannot be omitted. Then, the technique [suji] starting with the cut of White 6 and continuing with the jump of White 8 puts Black in a miserable position. 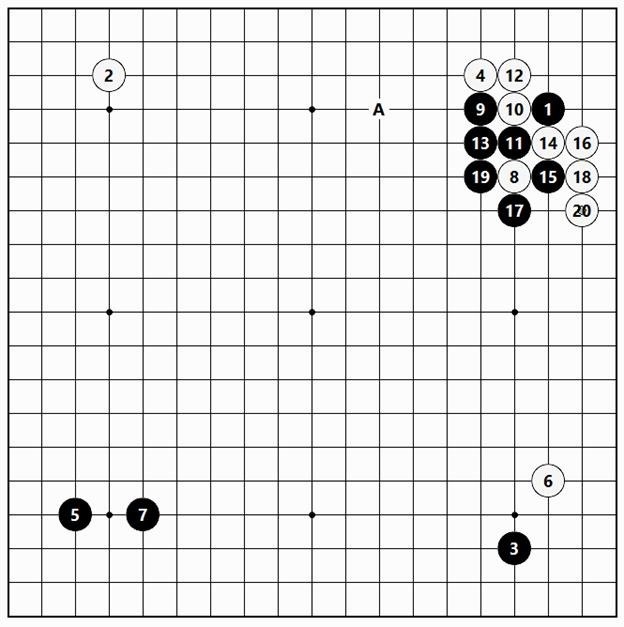 …attaching with White 1 and extending at 3 are the only moves. After Black 4 and White 5, the decision in the game is still to come. …the idea is to aim at pushing through with White 1 and cutting at 3, but thinking this through a bit more deeply, in connection with the ladder relationship, this just does not work out well at all. 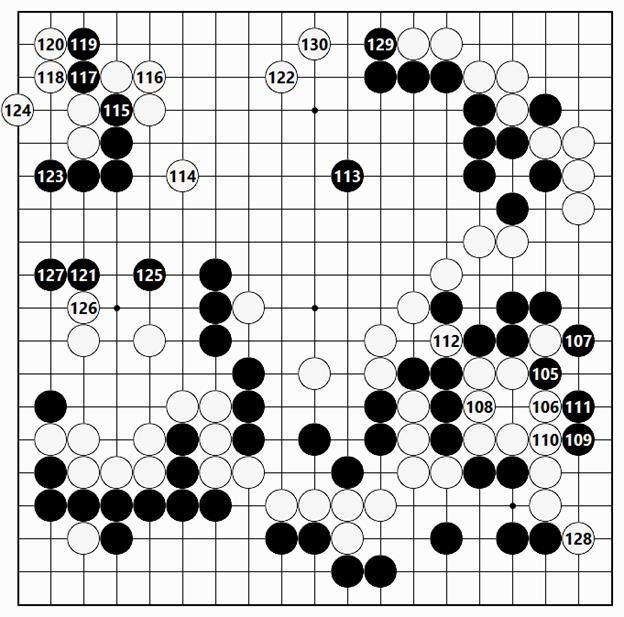 After the atari of Black 4, the sequence through the move-in-a-row of Black 10 is an unavoidable exchange of attacking and defending moves. At that point, even though it is possible for White to strike across the knight’s move [tsuke-koshi] with 11, Black can cut with 12 and continue with the sequence through Black 20, and on the contrary White’s shape is completely ruined. 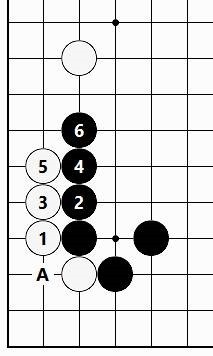 For the sake of thoroughness, the continuation is shown in alphabetical move order, with White A, Black B, White C, Black D, White E, Black F, White G and Black H.
In the middle of this sequence, even though the capping move of White 1 is conceivable, Black thrusts against White’s stones with 2, then jumps to 4, leaving White with no choice but to connect at 5. Black jumps out at 6, and White will be unable to salvage the positions on both the right and left. For that reason it was unavoidable for White to push at 64 and move out with the diagonal move at 66, seeking momentum to escape. However, Black takes this ideal opportunity to consolidate the territory on the lower side with 71, putting White into a severe position, to the point that there is nothing to be done in the game. 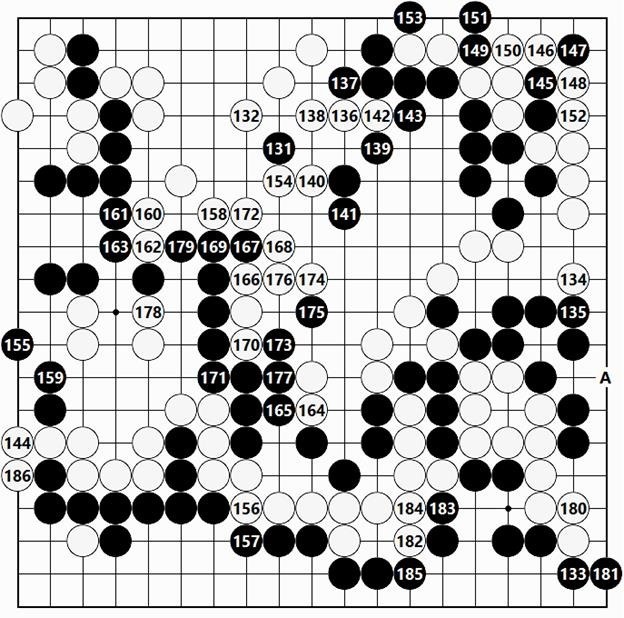 …White has to make shape with the hane of 2, but after Black keeps White’s groups separated with the two-step hane of 3, White would have to push through with 4 and cut with 6. in this situation Black will not only make thickness with the moves through Black 13, but by playing atari at Black 15, the board position is wrapped up. 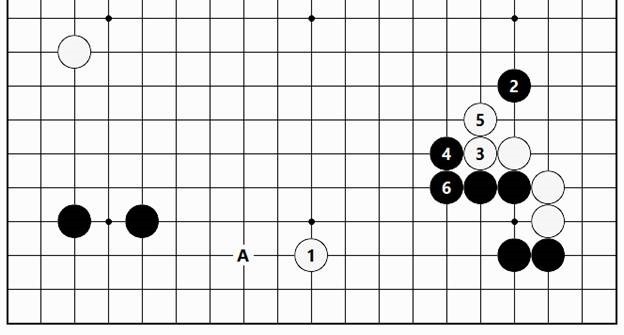 Furthermore, White’s shape here can be threatened by the potential [aji] of a Black connection at A, which is ominous for White. Therefore, it is tantamount to the understanding that this variation is out of the question. …Black could just defend with 1, and the shape of the game would be awful for White. It would be standard for White to reply with the diagonal move of 2, but after incurring the diagonal move of Black 3, I envisioned having no confidence in my chances. When Black counterattacks with 73, it is natural for White to cut with the moves starting with 74. The fact is that by making the forcing move of the jump of White 80, spurring Black into making the move of 83, so that White is given the boon of being able to play the atari of 86. In the midst of an unfortunate moment, fortune shines. …had Black made the move-in-a-row of 1, the outcome of the game would probably have been decided. Should White run away with 2, the jump of Black 3 is good, since White has no way of competing with Black’s territory on the lower side. The diagonal attachment of White 94 marks the arrival of a long-awaited chance. Should Black play 95 in the figure as the connection of 1 here, White answers with the two-step hane of 2 and 4. This aims at the cut of White A, which allows White to push through at 6, putting Black into a difficult and painful position. Pushing in to block with Black 97 is impelled by the momentum of the play. 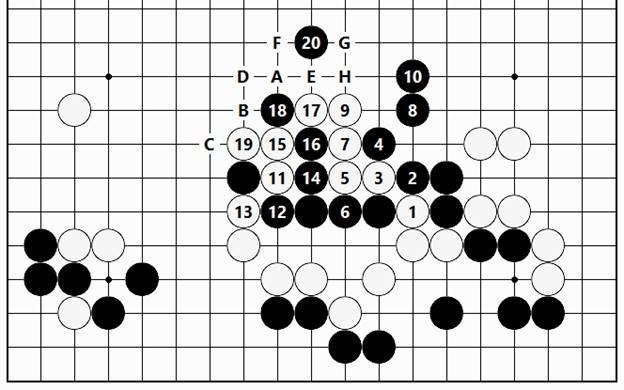 …if White connects underneath with 1 and 3, the territory on the right side would be completely solidified, but the center would be so thin and weak that White would have no chance to win the game. Being cut by Black 5 was unexpected. This cut turned out to be Black’s losing move. I thought that Black would play atari at 1. I read out the continuation from White 2 through the throw-in of 28. This turns the position into ko, and White has no chance to win this ko. In the end, Black ends the ko fight with 39. 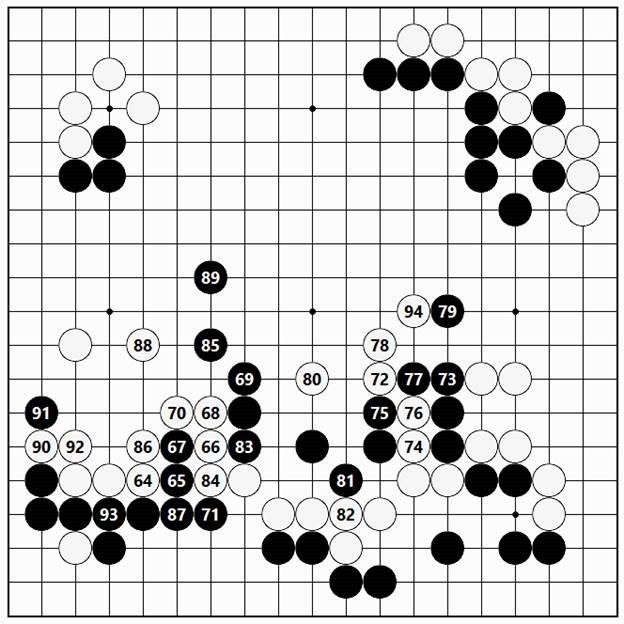 Black’s territory in the lower side area totals more than 70 points. 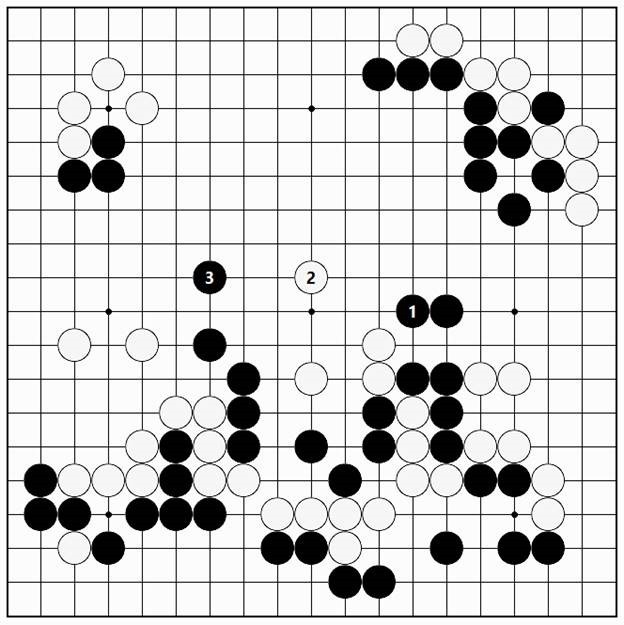 …the connection of Black 1 is met by White 2 and then Black is forced to make life in gote. What is more, it is unclear how Black can make life. When White captures at 12 in the figure, salvation is finally in sight. Moves such as the defensive play of White 32 are made to calmly respond in the knowledge that the game is won. In response to the forcing move of White 34, should Black fail to reply with the bad-shaped move of 35, White would have the placement at A. This is offered for reference sake. White 36 is a move aimed out since White played the diagonal move at 30 in the previous figure. 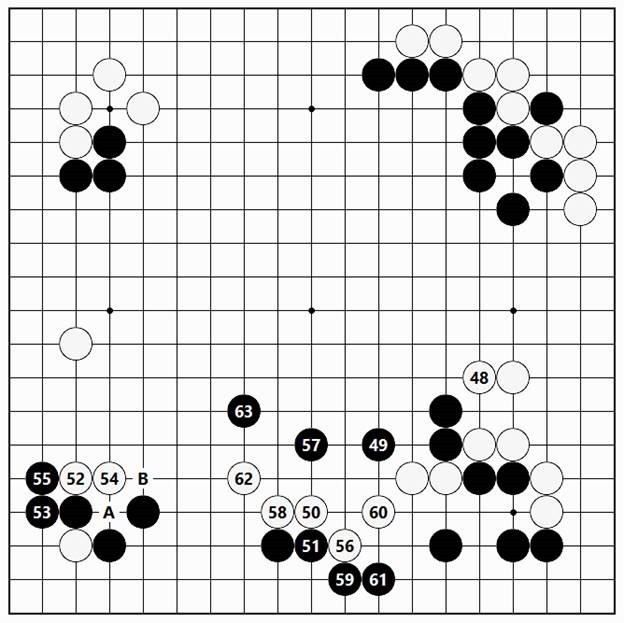 The descending move of White 44 could also have been used to connect at 49 in order to prevent the playing method Black uses in the upper right corner with 45 and the following. That was also a big move. 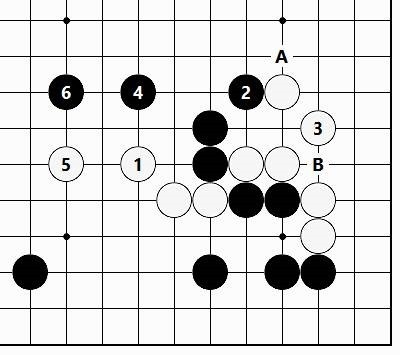 …if White connects at 1, Black 2 through 12 start a huge ko. 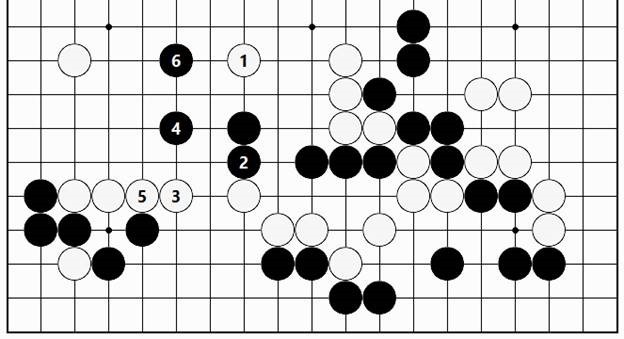 Since White cannot win this ko fight, Black is allowed to capture two stones with 53. 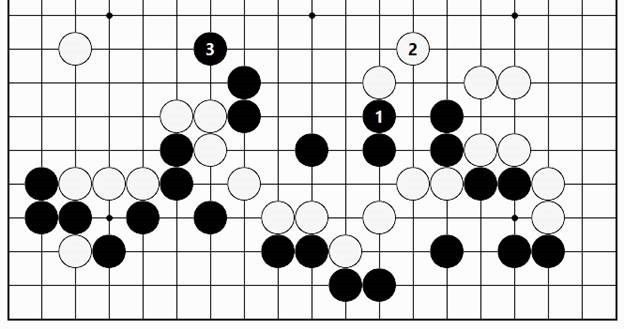 …if Black blocks at 1, the moves from White 2 through Black 11 would follow. White harasses Black’s group, forcing Black to live with two eyes. A deficit of 3~4 points on the board cannot be avoided. 186 moves. White wins by resignation.